You might remember, if you look at our original plan, that we were supposed to be in Thailand a full year ago. 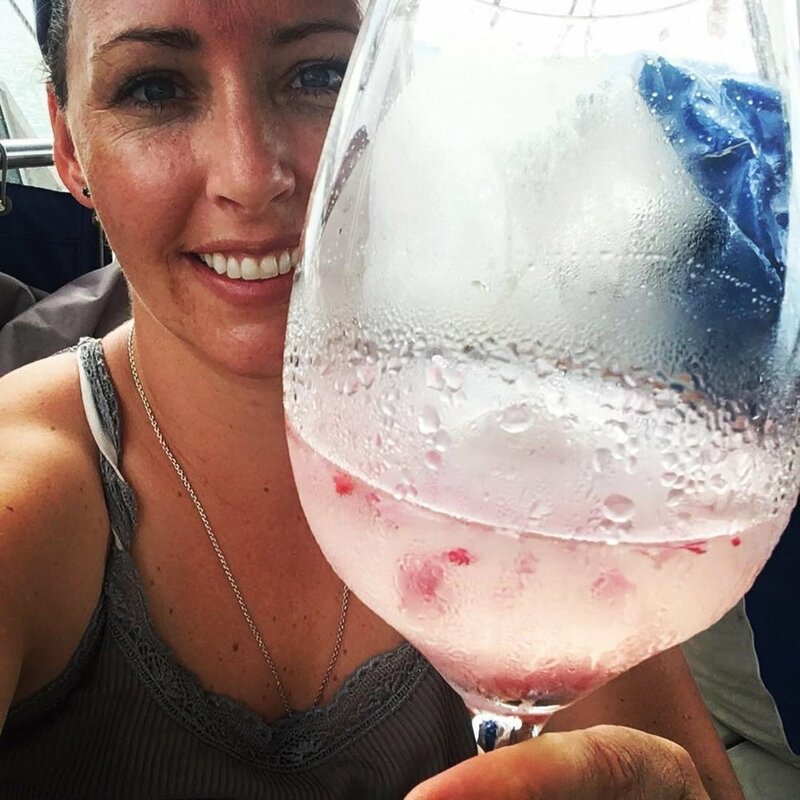 But if you’ve been following along since October 2017, you know that one thing led to another and immigration and custom procedures forced us to choose between a 30day/3000 mile sail up wind and up current (miserable!) or a 6 month/3000 mile plan working with better weather days (obviously much better). 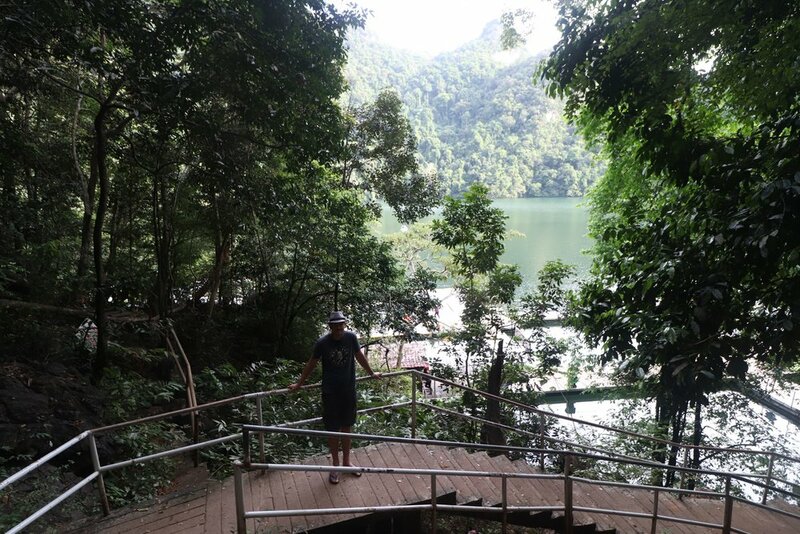 With Indonesia looking to be even more beautiful and more friendly than we ever imagined, we slowed down. And here we are a full year later…still not in Thailand! We are so close, though. 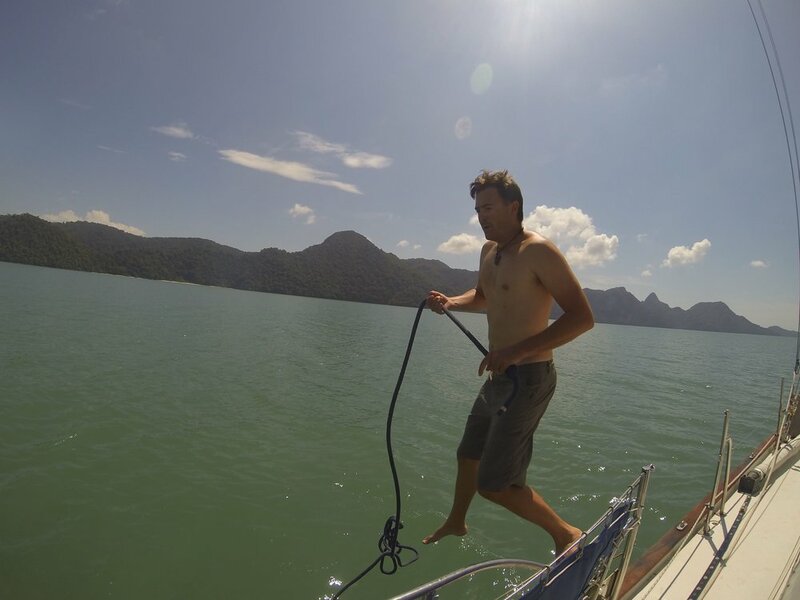 Langkawi is a very short fifty mile sail away. We can smell the Thai curry from here! “Come on guys, it’s time to GO!” Grin is whining because he feels as though Malaysia’s mangrove adventures are played out. He’s heard tales of pirate treasure caves in Thailand. “Let’s go. Can we go yet? Let’s go.” Sonrisa is raring to go, too. So, why were we still poking around Malaysia past our December 1 intended departure date? You can blame Andrew and his weak digestive disposition. We, however, blame Neptune. He’s testing us. The day after Sonrisa’s new sails were installed, she insisted on taking them for a spin even though the wind amounted to - at best - a cheery whistle from the lips of a garden gnome. We cranked them out and up, and the morning light lit the red, white and blue of that majestic Valiant logo. These sails are beautiful. Despite having no wind, Sonrisa slides along at a respectable 2.5 knot clip. Andrew decides this is a perfect moment to hop in behind Sonrisa for a gentle “tow,” at least until I start singing “Shark Bait, Ooh-Ahh-Ahh” at him. I ruin his day, and before long he’s back, safely on board. We arrived at our new anchorage hours early, but just as we were about to take the sails down and lay our anchor the weather turned. A squall crashed down the corridor and we had a blow on our hands. I guess we will sail on just for fun! 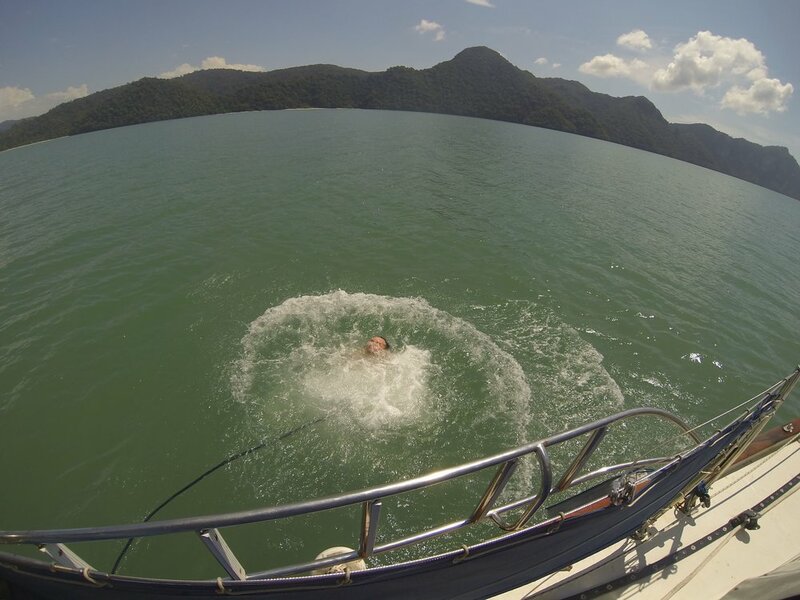 So, we shortened sail and tootled on around the corner to spend the afternoon in a more protected anchorage by Pregnant Maiden Lake, where according to local legend, if you take a swim, your fertility will be vastly improved. 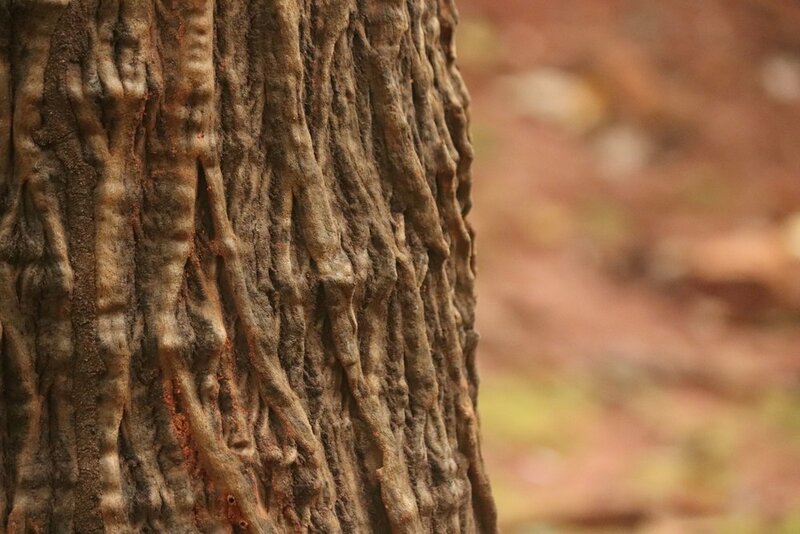 We walk a few steps through a forest with strangely textured trees, monkeys, and fuzzy squirrels, to arrive at a lake with funny little pedal boat carriages you can rent if that’s your thing. The next morning, I am feeling under the weather with a sore throat and a cough. Andrew tries to hike to the nearby waterfall, but he is stymied half way up by a digestive horror the likes of which we’ve yet to see onboard. He barely makes it shipboard at all, but when he does he turns even more green on the curls of waves causing our anchorage to heave and haw. 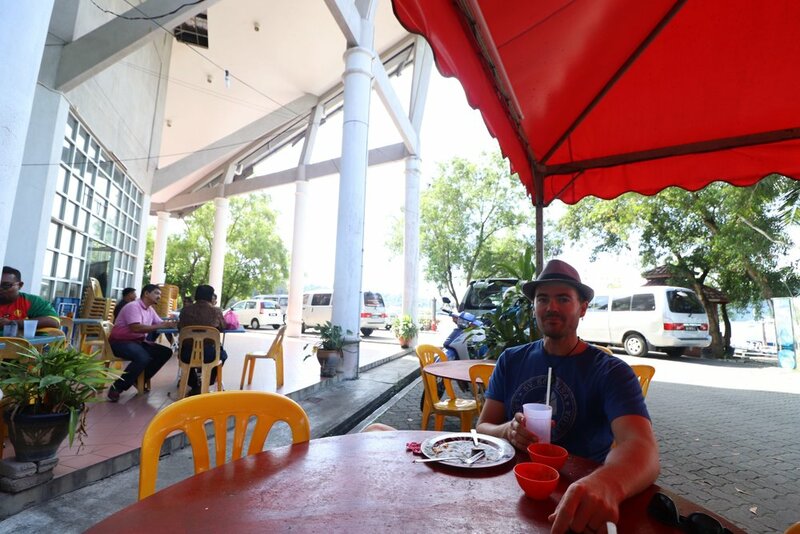 “We…must…go…back…to Kuah!” He declares. He goes forward on deck to lift the anchor. Now, Sonrisa is pretty loyal to Andrew, and I have to think she must be happy about her new sails, but I admit - we left her alone last night to join everyone on Fred-O’s boat, and she really rather prefers to play the host. So, none of us should be surprised when she decides now is the time to assert her displeasure. Andrew goes to press the “UP” pedal on the windlass (the device that rolls up the anchor chain) and for some reason (the bushings must need to be polished again), it doesn’t work. The sun beats down on Sonrisa’s deck, the waves are bouncing us all around, and Andrew is in the throes of fever sweats. Saying nothing, he starts manually cranking up the chain, one link at a time. Seeing the anchor is still firmly down, and will be for quite some time, I abandon my post behind the steering wheel and head toward the bow to help. I tip toe as I might approach a wounded tiger. “Is everything okay?” Captain Andrew rarely lashes out while in distress, but it’s possible. Today, he is too weak and miserable to expend the additional energy. “Here, let me crank a few.” I take the handle and crank some length of chain until it is short enough that I must go back to the helm. Andrew finishes the work, we set off under motor, and Andrew offers the contents of his bowels to Neptune. “I never understood why this is the toll Neptune so often exacts, but to each his own I guess.” Sonrisa says as we motor away leaving a trail of murk. Sonrisa and I motor back to Kuah, straight into an 15 knot headwind that would be fun to tack through if anyone on board had the health and energy to manage. Andrew groans and sweats in the beanbag under the shade. We barely have the anchor down again and he’s back to feeding the fishies. I offer him a cool cloth I had tucked into the freezer before we left the anchorage and force a ginger ale into his hand. I pat his back and soothe myself that he’ll be okay. He’s a puker, this happens all the time. 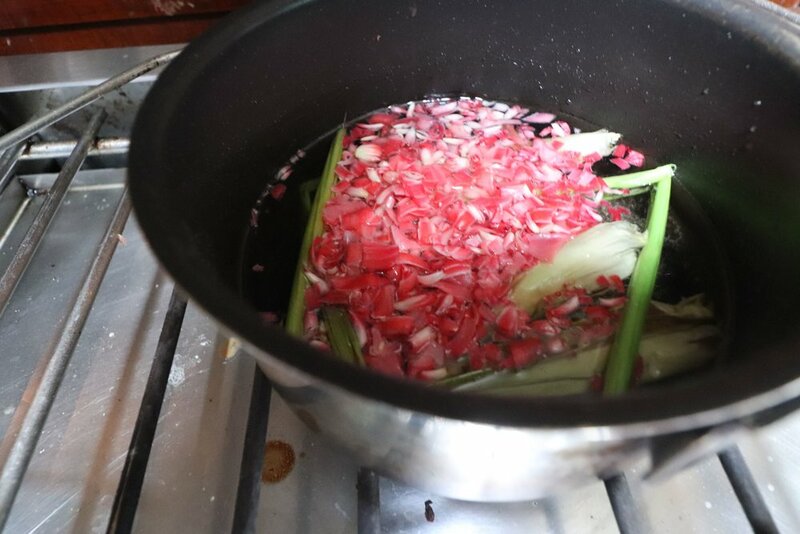 Andrew passes out in the forward bunk, and I putter around the galley making a new concoction of Gin, lemon juice, and a simple syrup flavored with lemongrass and torch ginger flower - a Malaysian specialty they use in their sour based noodle soups like Asam Laksa. Cough medicine for my cold, people! But, it takes us at least an extra week to recover. December 1st comes and goes, and we are still. not. in. Thailand. Sometimes I engage in self-recrimination, complaining: “if you were really serious about completing a circumnavigation, you’d be long gone from here by now.” But, I know. We must go with the flow; we cannot push faster than life allows us to go and we cannot drag our feet and delay, either. Knowing the balance is the tricky part. We are well conditioned to push ourselves beyond exhaustion or “tough it out.” But, the fact is, it is never safe to sail offshore while unwell - even if it is only a day sail away. I rub my thumb over the raised edge of our Thai visa, it awaits it’s entry stamp just a few miles Northward. As we start to feel better we take short day trips out to the City. We feed my cold with Indian Roti dipped in a lentil curry sauce, and Andrew does not starve his fever…maybe that’s why he is taking so long to recover. We make new friends with the restauranteur employing our laughable attempts at speaking Bahasa Malaysian, and I make friends with a new kitty when she decides to jump right up into my lap - whether I like it or not. We have to get our strength up so we can acquire some important duty free provisions: wine, beer, and chocolate! Yes, those are crates and boxes of beer, wine, and chocolate for Sonrisa. 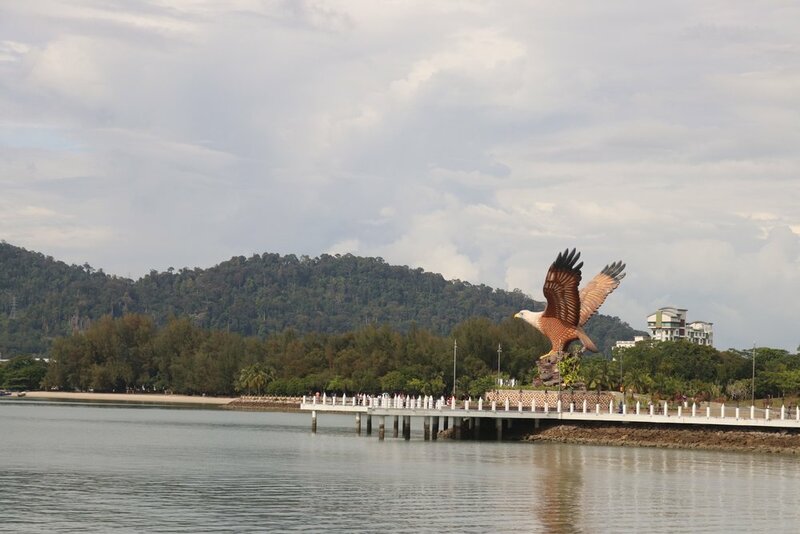 We visit the Langkawi Eagle Statue because we feel it would be poor form if we didn’t. We admire the intricate mosaic tile work; patterns everywhere. Finally, we feel up to par again and we begin the process of weaving our way through the check out, diesel acquisition quagmire. Thailand, we are on our way!